Wagglies, a popular dog product brand, have launched their brand new Probiotics for Dogs on Amazon U.S. 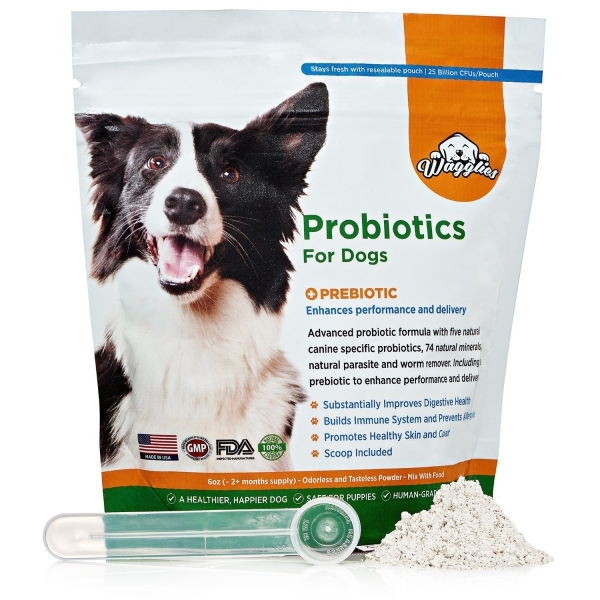 The dog probiotics are 100% natural, have 25 billion CFUs and have five strains of probiotic with an added prebiotic. The highly-concentrated custom formula is designed to prevent gas, diarrhea, bad breath, itching, urinary tract infections and nausea. Using probiotics is a quick and easy way to give a dog the correct amount of nutrients that they need in their diet. The prebiotic in Wagglies’ dog supplements is essential as it’s the ingredient that keeps the probiotics alive and encourages the good bacteria in the gut to grow. The supplements come in powder form with a press-seal bag for freshness, ease of use and less mess. The unscented, tasteless powder is designed to be easier for an animal to eat than pills or tablets, making it perfect for sensitive stomachs too. Wagglies are no strangers to selling products on Amazon. In the past, the brand have sold Puppy Training Pads on both Amazon U.S. and UK. More recently, the pet supplies brand launched their dog nail clippers onto both Amazon U.S. and UK and are currently best sellers in their categories on both sides of the Atlantic.